Since leaving Mudgee a week ago, we’ve driven 3500kms. That’s about 2200mis. 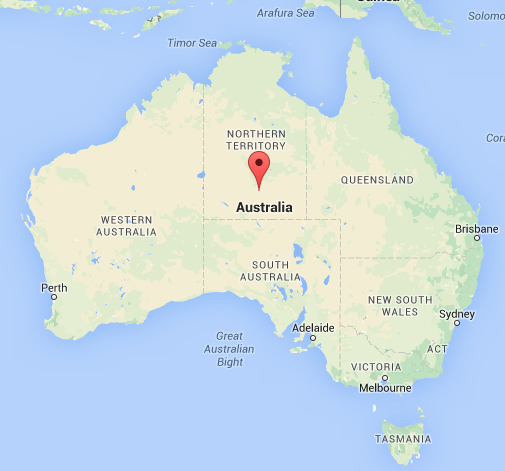 Right now we’re in Alice Springs, in the Northern Territory, Central Australia. Tomorrow we drive about 250kms north to Utopia, which is the aboriginal homeland where we’ll be staying for a few days, and filming. It’s been a beautiful drive across and up from Melbourne. The first day we drove about 900kms to Port Wakefield, north of Adelaide. Second night we stayed in Coober Pedy, which is an opal mining town some 800kms north of Port Wakefield. 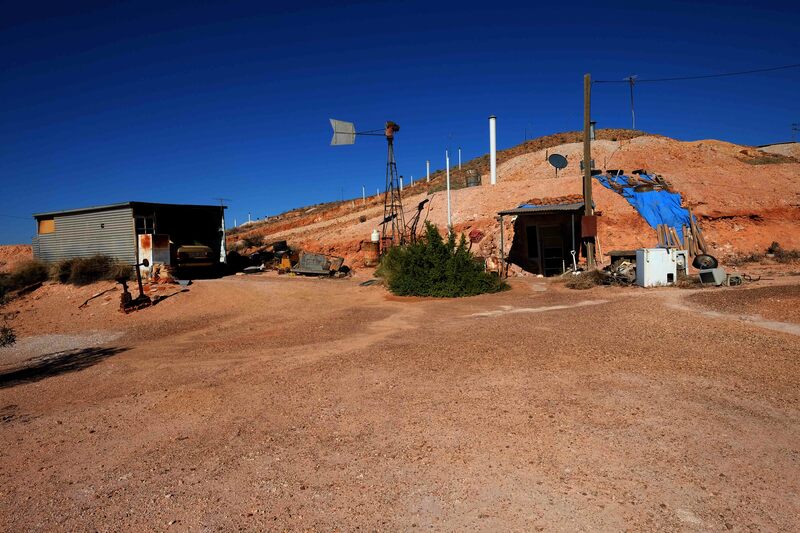 Driving into Coober Pedy, I noticed a line of TVs by an abandoned mine. 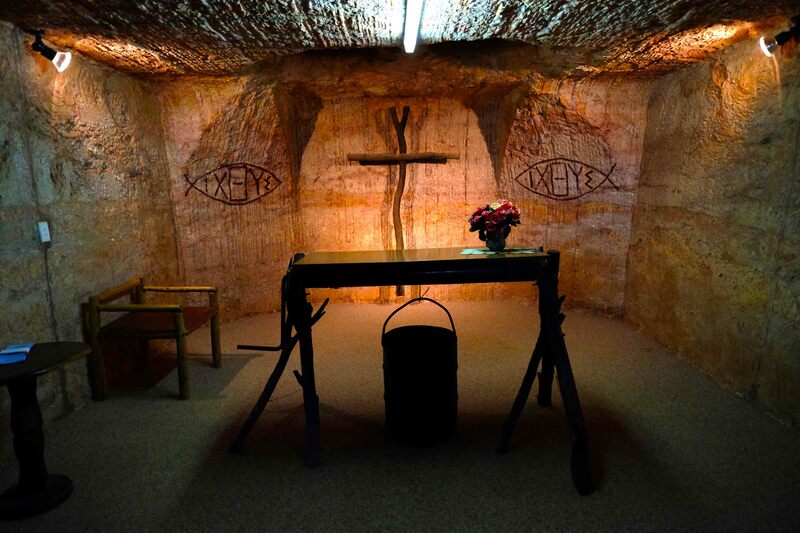 Coober Pedy is a place where people go who need to hide. They say there are more dead bodies in the mines here than there are people walking above ground. We were walking to a Greek Taverna for dinner, just on sunset, when a beat up old car pulled out and this bloke got out and walked up to us. He looked like Ivan Milat (a notorious Australia mass serial killer). He unfurled a tattered and grubby black velvet wallet, and produced some very dodgy opal jewellery. Actually it was faux opal. It was in fact polished stone, nothing more. 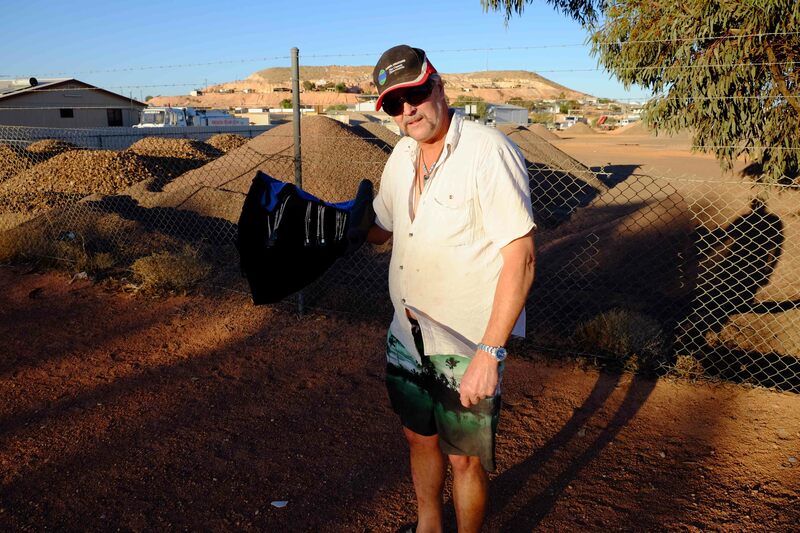 He told us that it was the cheapest opal we’d get in Coober Pedy, and said that he was selling a necklace for $40. 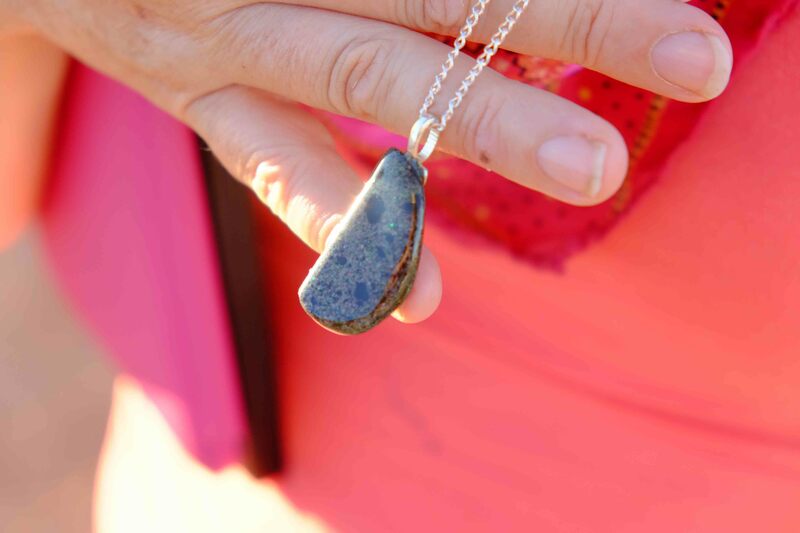 Jennifer, knowing that it was a scam and the stone was junk, told me we should buy a piece. So I shelled over forty bucks. As he drove away Jennifer said that it was the least we could do for him. It looked like he needed that sale. 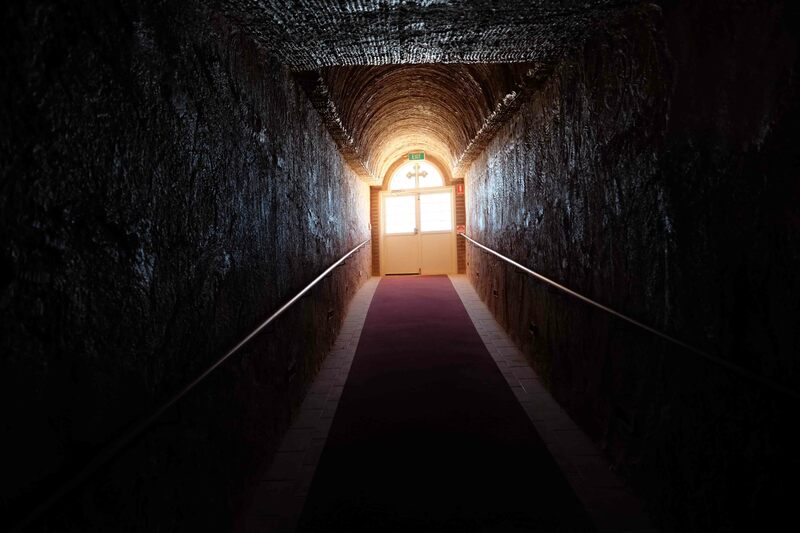 In Coober Pedy it gets so hot that everyone lives underground. 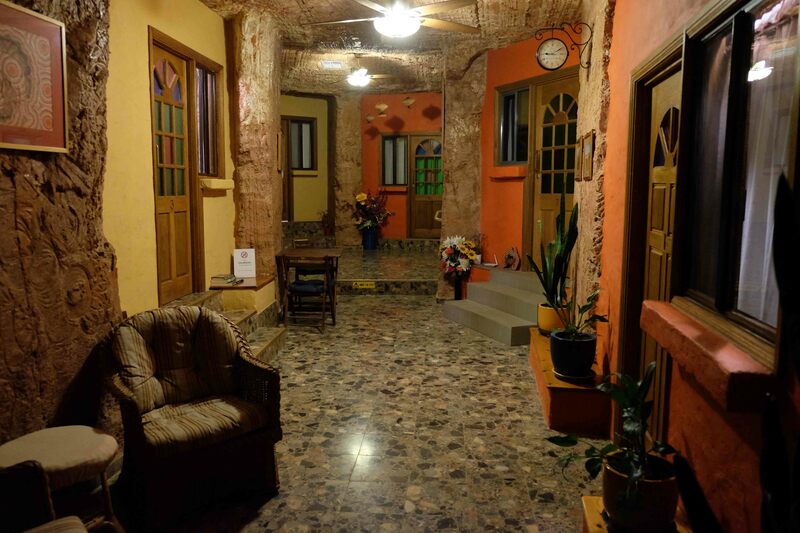 We stayed in an underground motel – the room was beautifully cool. Outside it was about 44 degrees Celsius – about 111Fahrenheit. 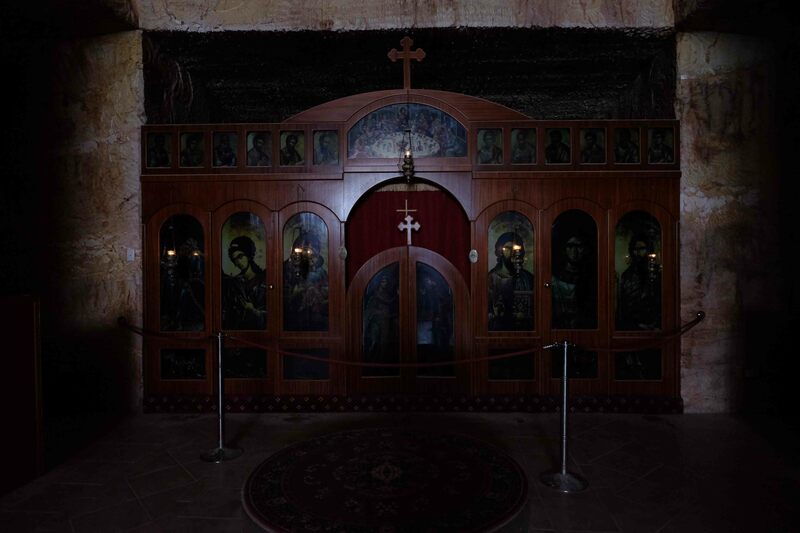 The other was larger – a Serbian Church. I will post some shots from Alice Springs tomorrow, and hopefully I will have some internet out at Utopia so I can post some shots from there too. It’s one of the most remote aboriginal communities in Australia. I’m very excited, and feel very privileged, to be going there to film. 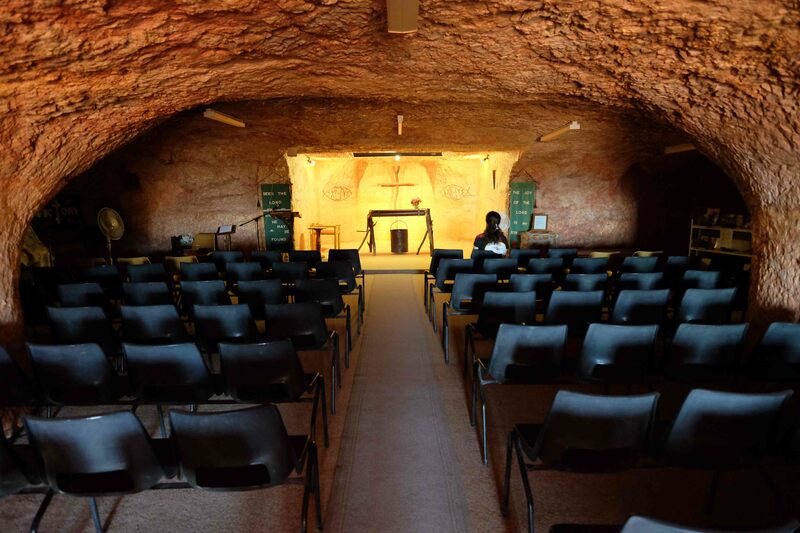 Here is one last shot of the underground church in Coober Pedy. 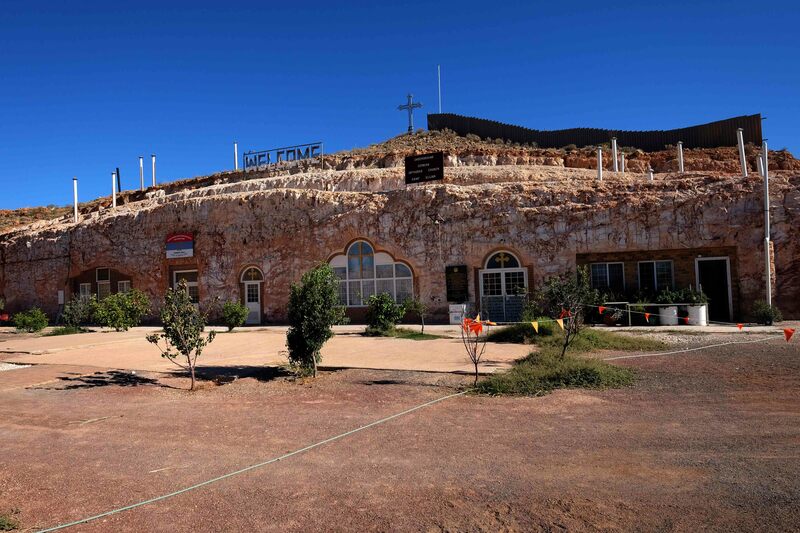 This entry was posted in Post Camino and tagged Alice Springs, Central Australia, Coober Pedy, Utopia by Bill Bennett. Bookmark the permalink. Wonderful little motel, isn’t it. And very strange!! Breathtaking underground shots! And the rest too. Just WOW! 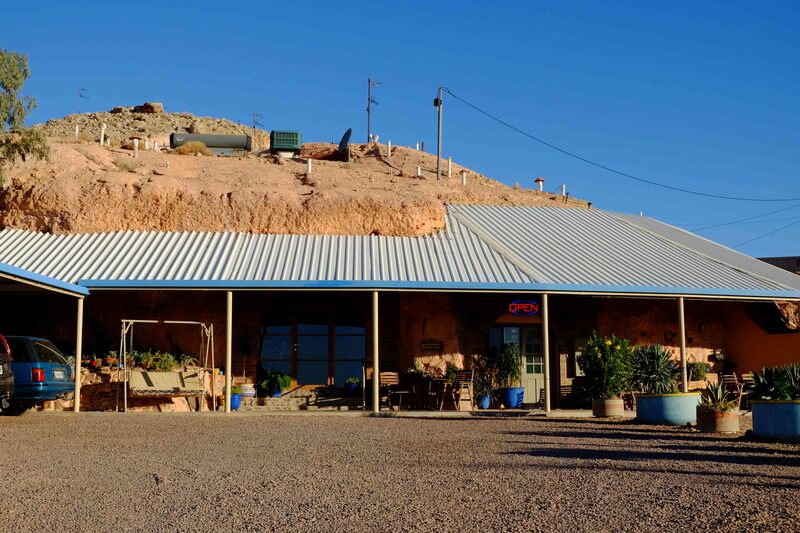 I stayed there too a couple of years ago – on my way to spend a month in Oodnadatta, unforgettable! I’m enjoying your blog! Thank you – more to come over the next week or so! Wonderful post and beautiful photos Bill. Those blue skies in the Aussie outback are incomparable. Good on Jen for buying the pendant – she is an angel, as you are Bill. Neither of you will ever know what the gentleman’s circumstances are, whether he has a ‘day job’ and this is a hobby, or whether making the pendants IS his ‘day job’. Your generosity may have helped more than you’ll ever know. 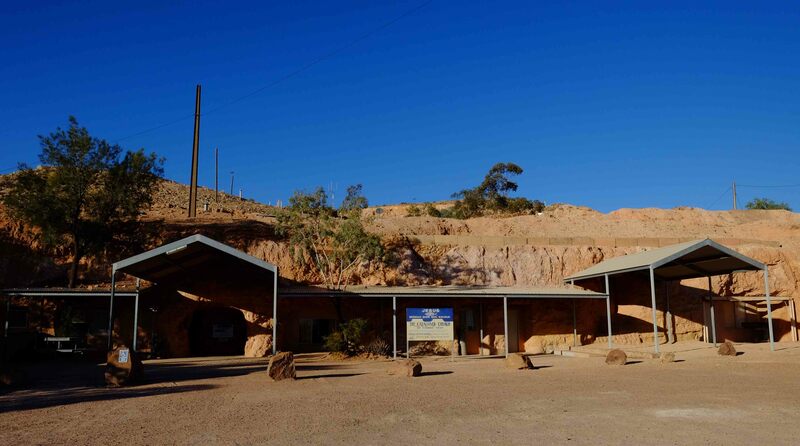 Steve and I stopped overnight in Coober Pedy back in 1994 on a road trip to Uluru – It’s a really fascinating town and we enjoyed being there immensely. I still remember the huge swathes of red Sturt Desert Pea flowers everywhere. They were stunning. 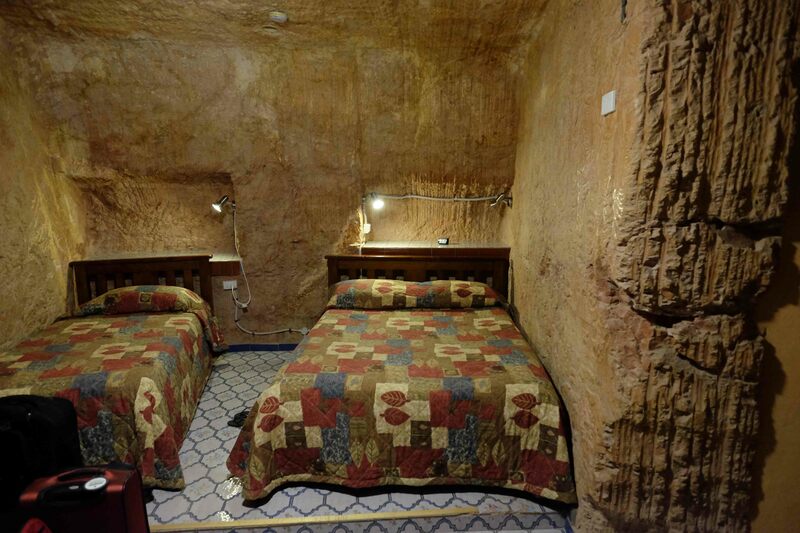 I remember going to Coober Pedy in the mid 70s. It was a rough town then. Very rough. A bit touristy now, but still quite unique… You and Stephen must have wonderful memories from that time. 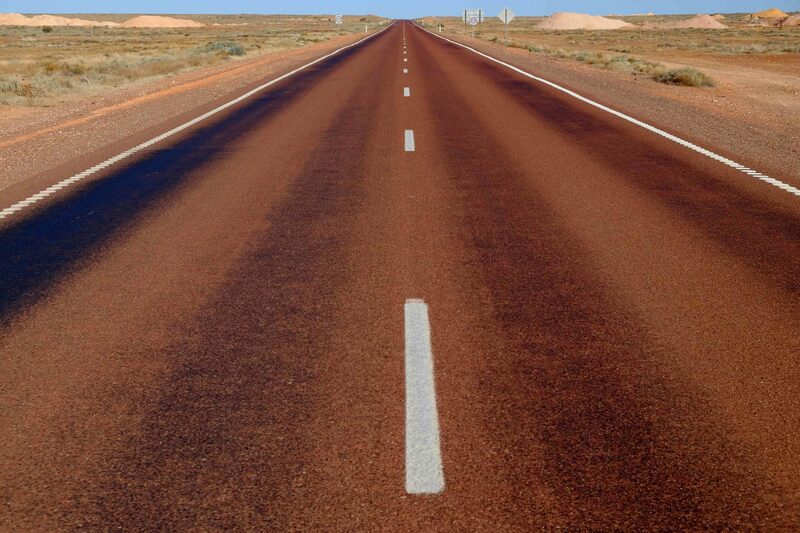 I’m looking forward to the next week – Utopia, then Uluru. I’ll have my trusty camera, or cameras, with me always! And, yes, that motel is quite spooky in parts, but I really enjoyed the whole experience there, howling dog and bagpipes notwithstanding!! Thanks for the info re Wake Up Sydney! Just joined! Hey Jenny – I have no phone re ration here – (no Optus here in Utopia) – but I got a telstra internet hub and so that’s giving me email and web browsing intermittently. But yes, it’s fascinating here. Can’t film during the day though – mid 40s temp. Too hot. But later this arvo I’ll do some more filming with Cowboy and his sisters. Wonderful people. It actually IS a bumper sticker here in the states! My sister Paloma Pavel and a friend penned it on a coffee shop napkin after the horror of the Rodney King trial riots. They were both brainstorming what is the correct reaction and cure for violence. The answer that came to them was not more violence! But to commit random acts of kinds and beauty, changing the the world with a positive force and energy. The original bumper sticker was “Commit Random Kindness and Senseless Acts of Beauty”. But it actually evolved into a real “random acts of kindness” movement (birthed from them, in the bay area) and really getting out there. Many years ago the story was picked up by a few magazines at the time, Reader’s Digest, and several others. My sister and friends also wrote a little book that tells the story of the choice we all hold to change the world in a powerful way! Rather than commit senseless acts of violence and crime we can join together and change the planet by committing random kindness and senseless acts of beauty. The 20th anniversary edition with a forward by Desmond Tutu was just published and you can find it on Amazon or at RandomKindnessProject.org. Recently I saw the bumper sticker on a light pole at a restaurant in a mountain town in Bishop,California. I had to take a photo for my sister (and i just sent it to Bill.) Many people have since lifted the slogan, and claimed it but my sister says that spreading the message is and having that energy is most important, not where it came from. The ultimate Random Kindess!! I’m with you on that Britta! Kathryn, that’s an amazing story. And I love the photo! Something so simple as that – doing what your sister and her friend did – can have a huge impact in society. Good for them! I remember, many years ago, when Oprah took up Random Acts of Kindness and featured many of her viewers carrying out these acts – eg buying the person behind them in the queue at Starbucks their choice of a coffee, or pay the toll – eg at the Sydney Harbour Bridge. It’s something I’d do in some ways but it wasn’t anything I really thought about much. I really took it on board after the Oprah programme. A couple of weeks back I carried out a small random act of kindness when I was out bike training and received a huge gift in return. I was riding up to a roundabout here in Cronulla (just outside Pilgrims’ Café which is significant, being a Camino person) when I saw an elderly gentleman on a mobility scooter going up to the kerb so he could cross the road at the roundabout. It’s a busy roundabout so I stopped and asked if I could help him across the road – he said yes so we both waited for the cars to stop at the entry into the roundabout – no one did so I waved madly at the next car and indicated my elderly companion. That car DID stop (thanks to that driver) and we crossed the road safely. At the other side I said to the gentleman “have a terrific day” and he replied “Luv – you have a terrific Life – BE GREEDY!! !” – I replied “You bet – I will”!!! Well, we laughed and laughed and we both went on our way! I should have leant over and given him a kiss on the cheek – that’s my one regret about a small gem of an experience – and the moment has stayed with me since – it’s sure given me so much more than the small act of kindness I performed for one of our senior citizens. Jenny, what a lovely story. And what a wonderful thing to do. Yes, you get back more than you give out, when you do such acts of kindness. Good on you! Cheers Bill – that small connection really made my day.